Since the 1990s, our field and survey research, conferences, and innovative initiatives in education, organizational change, and social policy have contributed to understanding and dialogue about creating harmony between work and the rest of life. Please visit the Wharton Work/Life Integration Project (founded in 1991) for more on this history and impact. It’s well past time for change in our national policy: We need legislation that establishes a national paid family and medical leave insurance program. Stew Friedman was the lead author on a letter to Congress from more than 200 U.S. business and management school faculty from more than 80 schools, including from the top 25 schools, urging swift consideration of national paid family and medical leave legislation. The initiative was widely covered in the press including in The Washington Post, Bloomberg, and CNN. In 2013 Friedman spoke at the U.S. State Department about the application of Total Leadership principles and methods for improving productivity and reducing stress for its staff worldwide. He conducted small-group workshops, consulted with senior officers, and gave a well-attended lecture in the main auditorium in which he explained how Total Leadership tools could help members of the State Department find creative ways to manage the intense demands of their work roles while fulfilling their aspirations in other parts of their lives. 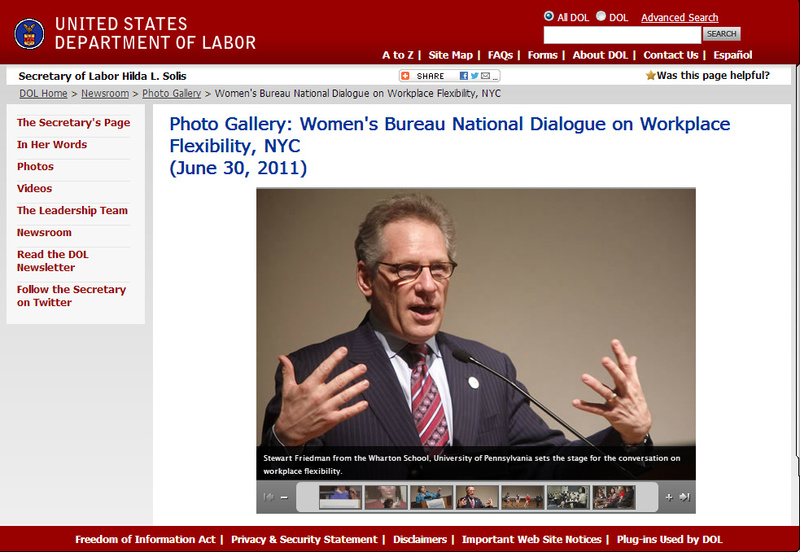 In 2011 Friedman was the opening keynote speaker at the U.S. Department of Labor’s National Dialogues on Workplace Flexibility conference in New York. In 2010 Friedman was invited to attend the White House Forum on Workplace Flexibility, hosted by the President and First Lady. He was among the small handful of academics invited to participate in this forum. Afterwards he was interviewed on ABC News about the historic significance of this conference. 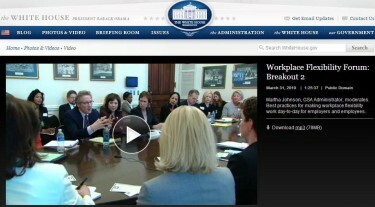 At the White House he discussed the Wharton course in a session with Secretary of Labor Hilda Solis. In 2010 Friedman was invited to speak at an Expert’s Forum at the United Nations and to consult to that organization on initiatives to transform the workplace to make it more hospitable for women. In 2003 Friedman was asked by American Psychological Association President Diane Halpern to contribute to a task force she created on bringing work/life research to bear on policy and practice, and he served as moderator for a panel on child care at the APA annual meetings that year. This landmark gathering in 2000, co-sponsored by the Wharton Work/Life Integration Project, brought together 75 thought leaders and decision-makers from outside the traditional circle of those directly concerned with child care and work/family issues. Leaders from the business community sat side by side with those from the political arena, the advocacy sphere, and academia. Among those present were the mayor of a major city; legislators from several states; executives from industries as varied as manufacturing, financial services, transportation and healthcare; and leading experts on policy issues. The conference enabled meaningful dialogue across sectors. Working groups collaborated on identifying programs and partnerships to benefit all working families. 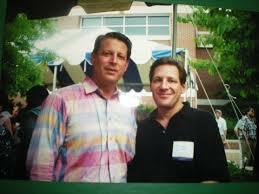 Our early contributions in the work/life field were recognized when Stew Friedman was asked to participate in an eight-member task force on designing a national work-family conference, Vice President Al Gore’s Family Reunion V: Family and Work Expert’s Forum, held in Nashville in 1996. He met numerous times with the Vice President and Friedman was one of four panelists in a session that he moderated at the conference. Stew Friedman has served on the advisory boards of Bright Horizons Family Solutions, the world’s leading provider of on-site corporate child care; the Sloan Foundation Work/Life Research Network; the Alliance for Work-Life Progress; Fatherly.com; and on Deloitte’s External Advisory Council on Diversity and Inclusion. 2017. Earning Power: Growth in pay is slower for women than for men, even if they go to college, study finds, CNBC, June. 2017. How People Decide Whether to Have Children, The Atlantic, May. 2017. Paternity leave goes mainstream: Fatherly ranks 50 best companies for new dads, CNBC, May. 2017. Is job-sharing a cop-out or the way to avoid burnout?, MarketWatch, April. 2017. Childbirth for women in their 30s at 50-year high, Philadelphia Inquirer, March. 2017. This former Wall Street wolf is turning trading algorithms into fine art, CNBC, January. 2016. Theories for the digitally distracted generation. Financial Times, December. 2016. The Unexpected Political Influence Your Boss Has On Your Vote. Fast Company, November. 2016. How To Break Your Addiction To Work. Harvard Business Review,May. 2015. Dads: We Want Work-Life Balance, Too. Forbes,October. 2015. Law Firms Are Learning: Work-Life Balance Isn’t Just for Moms. The Atlantic, September. 2015. Movement aims to make work more family friendly, less ‘hostile’. CNBC, September. 2015. Big Leaps for Parental Leave, If Workers Actually Take It. The New York Times, September. 2015. Hey Male CEOs, It’s Your Turn to Take Parental Leave. WIRED, September. 2015. Changing Demands On Employees In The Modern American Workplace. The Diane Rehm Show on NPR, August. 2015. Work Policies May Be Kinder, But Brutal Competition Isn’t. The New York Times, August. 2015. A gender-equality club, run by men. Washington Post, August. 2015. Paid parental leave should be U.S. law — not just a company perk. Fortune, August. 2015. Adobe is doubling its paid maternity leave following similar announcements from Netflix and Microsoft. Business Insider, August. 2015. More Than Their Mothers, Young Women Plan Career Pauses. The New York Times, July. 2015. How to keep work from killing your vacation when you just can’t leave it all behind. Washington Post, July. 2015. How to be a great boss — and leave on time. BBC, July. 2015. How Fatherly plans to corner the market on millennial dads. Fortune, April. 2015. Career Planning: Experts’ Advice for the Second Machine Age. Financial Times, March. 2015. Still Missing: Female Business Leaders. CNN Money, March. 2014. Paternity Leave Costing Fathers in Workplace, CBS This Morning, November. 2014. Is Work-Family Conflict Reaching a Tipping Point? Harvard Business, March. 2013. More Millennials are putting pregnancy on pause. Chicago Public Radio, October. 2013. Paternity Leave isn’t just about dads, Washington Post, June. 2013. A Father’s Day gift that keeps giving. Washington Policy Watch, June. 2013. Has the Movement for Women’s Equality Hit a Wall? PRI’s To The Point, February. 2012. Why Companies Should Force Employees to Unplug, TIME, February. 2011. Men Negotiating the Work-Life Balance. Radio Times with Marty Moss-Coane, August. 2008. Hot Ticket to B-School: Bringing Life Values to Corporate Ethics, New York Times, May. For media coverage on other topics click here.